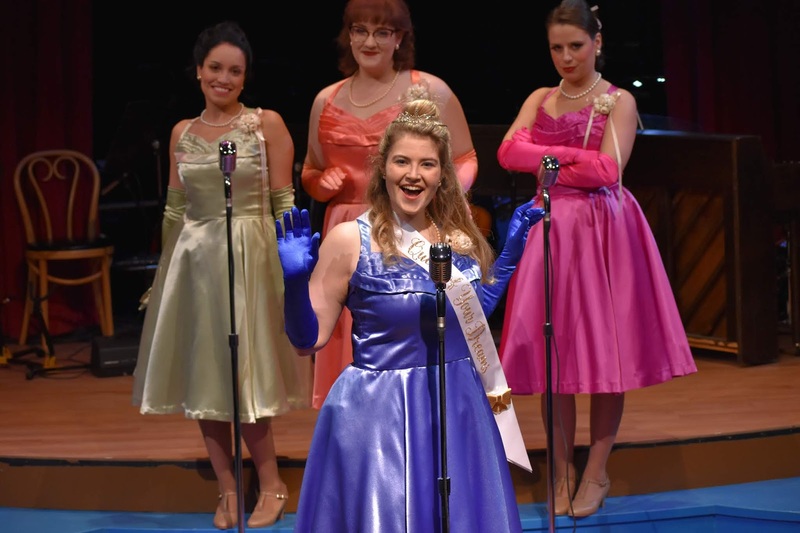 Loaded with dozens of “top ten” songs from the pop music charts of the 50’s and 60’s, “The Marvelous Wonderettes” is a fanciful trip down memory lane to the gymnasium of Rockville High, and the romances and rivalries of four young girls who are the featured performers at their senior prom. In Act I, which is set in 1958, life starts out so well, until simmering egos, and just who gets the spotlight next, plunge the festivities into the realm of youthful angst and who just stole whose boyfriend last. All quite predictable, and predictably fun. The retelling of these dizzying dramas is cleverly woven together by the Wonderettes portrayed by Mollie Posnik, Tina Sparkle, Kait Rankins, and Kaytlyn Vandeloecht, as the names of those fickle boyfriends and favorite school staff members (kudos to the volunteers from the audience for a wealth of suggestions), just happen to be part of those great 50’s and 60’s songs, giving the girls plenty of ammunition to tell their tales of woe, and belittle their rivals. Act II moves the foursome on to 1968, and their ten-year high school reunion. The years may have marched on, but some of those old hurts, insecurities, and rivalries just can’t be kept under control. As these things tend to do, the girls reach a boiling point, all done with great 60’s pop tunes of love and loss. Surprisingly, even some wisdom is gained, until all is well once again at Rockville High, as romance flourishes, the past fades, and friendships are rekindled. 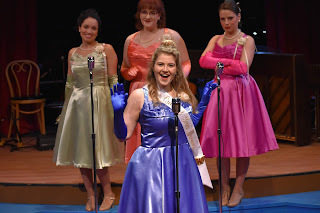 Danny Eaton’s direction keeps the pace fast and fun, colorful costumes by Dawn McKay shine on stage, and the gym setting is classic, down to the photos of Ike and LBJ, red alarm bells, the stars and stripes displayed (with the correct number of stars), and the basketball court hardwoods are polished to a sheen. Like proms and reunions, this show is a fun evening to remember.